The Star Wars saga continues with Clone Wars, in which Anakin Skywalker is assigned a young Padawan named Ahsoka Tano, who must help Anakin save Jabba the Hutt's son who has been kidnapped. Meanwhile, Count Dooku and his newest apprentice Asajj Ventress, will stop at nothing to ensure that Anakin and Ahsoka fail at their quest. On the front lines of the Clone Wars, Obi-Wan Kenobi and Master Yoda lead the massive clone army in a valiant effort to resist the forces of the dark side. Star Wars: Clone Wars is directed by Dave Filoni and is mainly a kid fare feature. Originally intended to air as a special two-hour feature film on Cartoon Network, Clone Wars, feels very much just that. The film really should have never made it to theaters, but Lucas, is not known for holding back at merchandising, so why would he here? The problem is that being released as a feature film, too many fans were lead to believe they would get something much more than a exclusive Cartoon Network movie. Let's talk about the good first. Star Wars: Clone Wars has amazing CGI cinematography. The entire film has vibrant colors that jump off the screen at you with explosive energy and battle sequences to add to the enjoyment. The new look to all of the characters is particularly interesting and quite stylized, but works very well for the feel of the film. The battle sequences throughout Clone Wars are done with so much energy, they come very close to what we have become so familar with in the last three Star Wars films. All of the CGI is again remarkable and the one true redeeming factor to the film. The story and characters are so watered down and generic here in Clone Wars, that I can see why so many critic gave it such a hard time. The story is lame and once again revisits some of the same worlds that we have seen enough of in the other six films. Did we really need to revisit Tatooine Lucas? They did a real good job of making the characters we have come to love, terrible here in Clone Wars as well. Anakin's dialogue is so bad, I'm surprised he didn't break out with a "OMG" or "LOL" in the flick. His new Padawan is extremely annoying with her sarcastic dialogue and nick names for Skywalker like "Sky Guy." Count Dooku and his apprentice Asajj Ventress were not so bad, but nowhere near the intensity we've seen from the previous films. Luckily Yoda and Obi-Wan are under utilized in the film, so they couldn't tarnish them too bad. 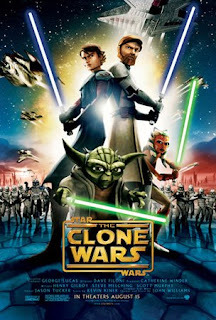 Overall Star Wars: Clone Wars was a bad film, but not bad for a TV movie made for children, especially one that preceeds a new series on Cartoon Network. The film is strictly for kids, adult fans of the saga will be disappointed, especially if they think it will be anywhere near the caliber of the saga live action films. I was fortunate to see the film post-bad reviews from everyone, so my expectations were extremely low and wasn't outraged as most fans seemed to be. My kids loved it, and isn't that what really matters here? This wasn't an adult film, it was a film to lead a new generation of kids to Star Wars. Quite honestly, it was right up their alley too.